Some years ago, a dear friend of mine gave me a personalised t-shirt with slogan that read Kaur – Ready for WAR. It was great to see this little manifestation of the less talked about side of being Kaur, or as it is usually translated in English, princess. The world we live in puts pink and princesses in the same box, and it was a journey of self-identification that eventually made me embrace my identity in its complete form, best described as warrior-princess. Guru Gobind Singh gave the name of Kaur to all Sikh women on the occasion of Vaisakhi in 1699, when his wife added some sugar to the amrit water making it sweet, thus representing the sweetness of the feminine. Personally, I didn’t really feel sweet and feminine very often. In fact, I felt everything else but sweet and feminine. Wild, crazy, unpredictable, free and even scary would describe me better, sometimes all at the same time. Not very princess-like by the standards of the modern world. Looking at the life of Indian royalty in the 17th century did not provide many answers either as to why our Guru would bestow this title to all women. It was not an easy life, attended by numerous servants and showered with precious stones she may be, but also traded as a commodity for her royal blood in the game of power and politics. It is only when I remembered that with the sweetness of amrit, Guru Gobind Singh also gave all women an equal right to own and carry weapons, that it all started to make sense. Sikh kirpan is not a symbol, it is a real sword, a real weapon that can be used both for protection and attack. Kaur is a warrior and princess rolled into one. It is a new, or at least well forgotten, archetype in our psyche. The women of the future will be equally sweet and lethal. Her actions carry the nobility and the subtle sensitivity of feminine, but she is also not afraid to raise the sword and fight for the Truth. She is Mai Bhago, who led Sikh soldiers against the Mughals in 1705. In the heat of war where Sikhs were outnumbered, forty men deserted their Guru and the battlefield. She brought them back. She awakened their courage. Such is a destiny of the warrior-princess; she is a natural leader. Whether we realise it or not, women are always in the battle. This warrior side of us usually takes shadow form in the battle with our appearance, our weight or our man. We are made to believe we are not perfect as we are to stop us from awakening to what really matters. Yet the process of awakening has already began and the world as we know it will cease to exit when the princess-warrior is manifested within us. 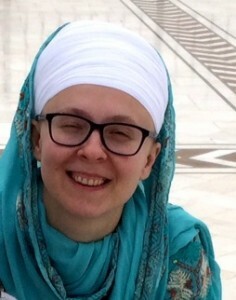 Prem Siri Kaur is a mother, digital media professional and has recently completed MA Translation Theory and Practice from UCL. Her dissertation looked at the issue of equivalence in the translation of Sikh scriptures including an original translation of Anand Sahib. yes, i feel the same, kaur is not the meaning of very princess-like by the standards of the modern world,many times is more like warrior. i am the same like you wild, crazy,unpredictable, free and even scary. your words touch my heart.